This editorial was inspired by 2001 French film, Amélie! Amélie is the type of film that sticks with you – with visual prowess and a lovable lead character. In our case, the film resonated with Ashlee Hamon Photography and inspired several local vendors to contribute their time and talents to create a lush backdrop for our sweet models. From hand-tied florals and quirky vegetable and fruit accents, each little piece is pulled from elements of the movie that is so beloved. This is the perfect inspiration for winter with rich greens, amber, terra cotta, and shades of red that vary from fire engine to magenta. While it has a hint of vintage, the concept is entirely fit for a modern couple that loves cinema, are francophiles, or just love a little bit of pretty, organic inspiration! 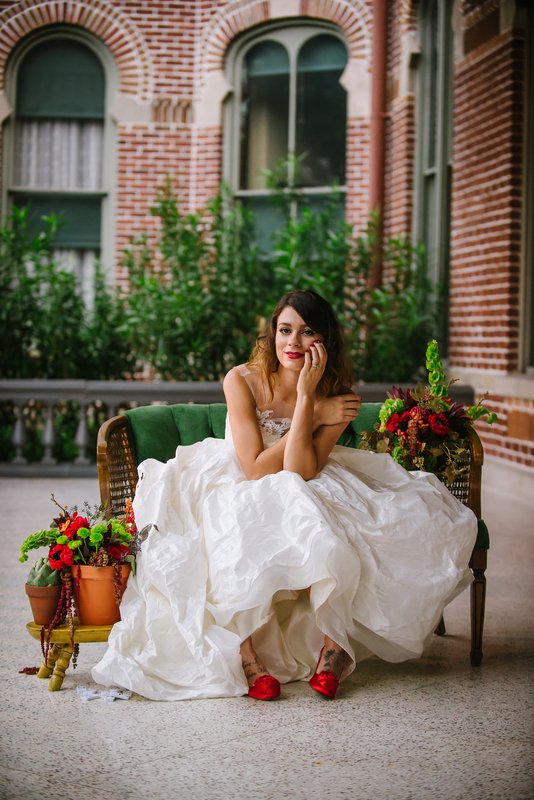 This shoot was featured this fall on RUFFLED!! !